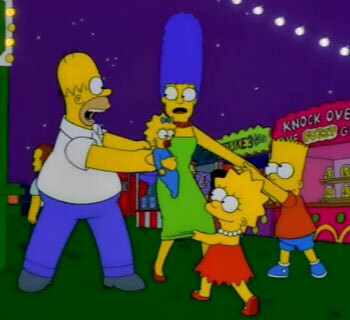 Marge: Okay, now we know you’re allergic to cauliflower. 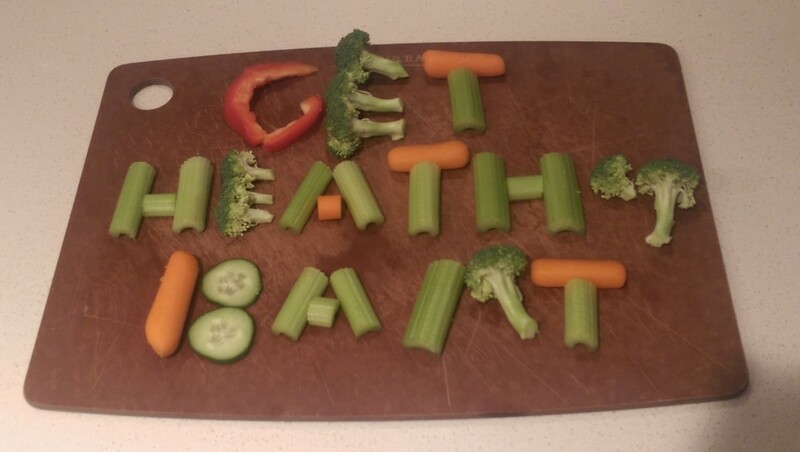 But I made a special platter of vegetables that are good for you. It’s graffiti you can eatie! 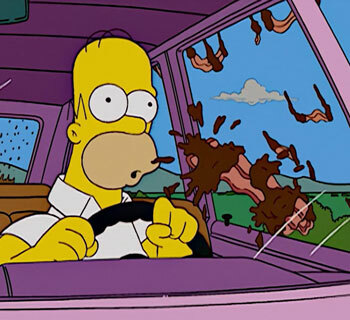 As previously noted, Marge tries to show her love for her family through food and that effort is once again completely disregarded by Bart. 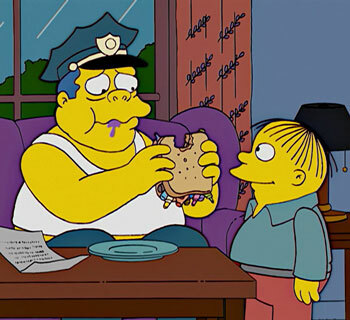 If this episode proves anything it’s that Bart chooses to stop eating junk food and lose weight because it has bankrupted his family, not because he cares about his health. Anyway, I’m once again venturing into “make food that spells something” type of recipe and as before, it’s not really worth the effort. Making this platter requires a bit of creative vegetable chopping depending on the letter being made. You shouldn’t need to chop the carrots if you use baby carrots, which I did; the celery length should be cut depending on where it’s needed. Cut cucumber into circles and cut broccoli with short stems or they will not fit on the plate. By far the hardest item to cut is the red pepper “G”. I used a paring knife and cut along an angle and still needed a few attempts. I don’t care how healthy raw vegetables are, unless they are accompanied by some type of dip I’m really not interested in eating them. Carrots and cucumber are acceptable plain, but raw celery with nothing on it? The texture of the celery alone with all the little strings and whatnot, no thanks. 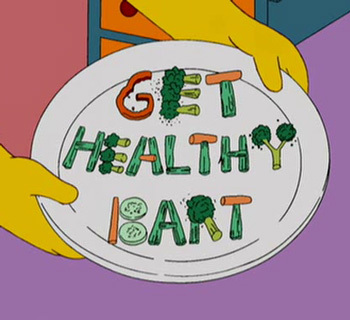 However, if you add a big dollop of full fat ranch dressing to the Get Healthy Bart vegetable platter; now you’re eating both delicious and healthy! A caramel cod does seem like a healthy alternative to fresh, raw vegetables. After all I’m pretty sure that caramel is part of the all important “Fats & Sweets” on the Neglected Food Groups chart. Anyway, this is on my “to make” list…but not super high because it sounds pretty gross.